Here is a look at last month's stats and commentary. Note inventory is still excruciatingly low! (Click to enlarge). 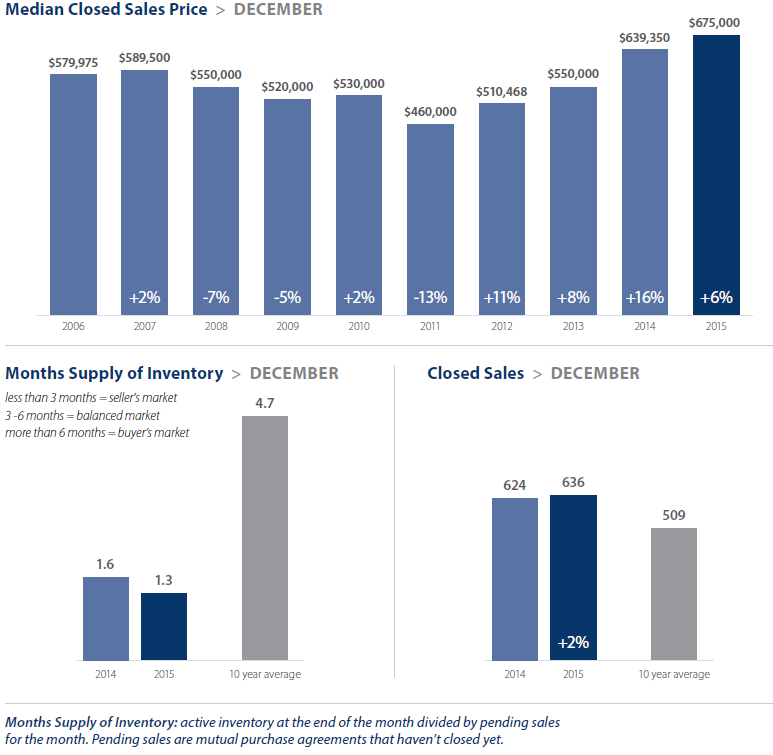 2015 closed out the year with home prices hitting new highs, and inventory hitting new lows. The market is tough for buyers who are competing for a dwindling number of homes, but it’s also the greatest seller’s market in recent memory. Home prices on the Eastside continued to climb. The Eastside extended its lead as the most expensive market in King County, posting a median home price of $675,000 in December. A strong technology sector here has helped boost demand for a very limited supply of properties. Competition among buyers is fierce at every price point, including luxury homes. Multiple offers are the norm, and cash sales are common. For buyers, a savvy broker can make the difference between an accepted offer or another disappointment. More market commentary available here. We also had our in-house chief economist, Matthew Gardner, come out with his predictions or 2016. You can link to that post via Windermere's blog here.